All levels of guitar player are welcome, from Beginners to Advanced Students. All styles can be taught from Rock & Pop to Country & Bluegrass to Flamenco & Classical. 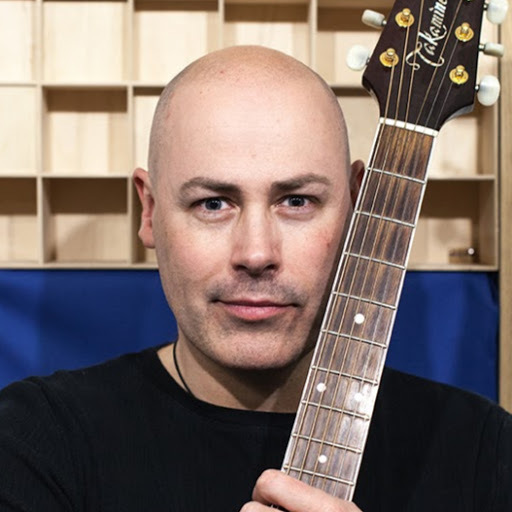 Scales, Chords, Arpeggios and Playing Techniques are all studied progressively. Songs and pieces used in the guitar lessons are selected in consultation with the student – no learning music that you don’t enjoy! Advanced guitar lessons also cover improvisation and musicianship. Music theory and sight reading can also be covered if the student wishes. 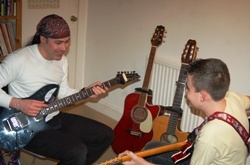 Guitar lessons are available in 1 hour (£25) or 30 minute (£15) sessions. Using Skype I can also deliver tuition remotely. A 30 minute guitar lesson by webcam costs £12. Gift Vouchers are available for any amount. An ideal gift for Birthdays, Christmas, Father’s Day or Mother’s Day. £5 each – ‘Basic Guitar Maintenance & Tuning’, ’30 Blues Licks’ and more are available in the online shop.